Air quality in the UK is getting worse and worse year on year, could it potentially impact your home value and desirability. What Exactly Is Air Pollution? A mix of dangerous gases and particles that rise into the atmosphere, mostly by man-made influences. UK air pollution is becoming a big issue as it has many negative impacts on health and environment. 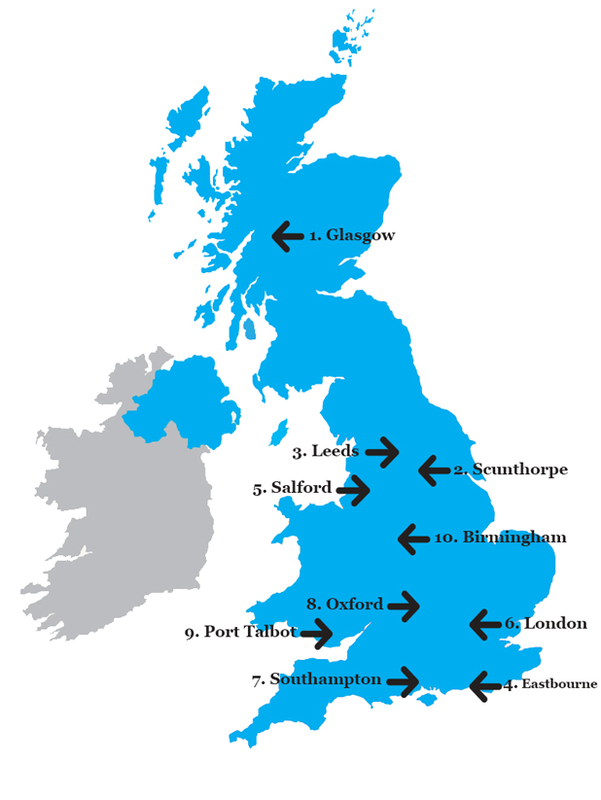 New research from WHO (World Health Organisation) shows that 10 urban areas across the UK breached the safe limit set for PM10. Air pollution is measured in particulate matter (PMs for short). In the graphic above you can see what towns in the UK breached safety levels for air pollution, according to the WHO report. With the majority of the towns & cities being in the south of England, big population centres such as London, Southampton, Oxford and Eastbourne make an appearence. Birmingham, Salford, Leeds and Scunthorpe are the worst offenders in the Midlands and northern England. Perhaps surprisingly, the worst offending city in the UK is Glasgow, according to the WHO report. How Exactly Will Air Pollution Impact My House Price? There's been a lot of debate on how pollution may impact on house value, Surveyors are beginning to often make comments on how air or noise pollution make an area less desirable. This is because long-term health effects can include chronic respiratory disease, lung cancer, heart disease, and even damage to the brain, nerves, liver, or kidneys. It's even been speculated that prolonged exposure can cause depression. Air pollution is also particularly bad for children, so if you're a young family, you'll want to try to stay clear of areas with high particulate matter (PM). What do you think of the deepening pollution crisis gripping the UK? Tweet us @HouseBuyFast with your opinions! Last updated on 02/02/2017 by Jonathan Rolande.